The Fatsia Plant or Japanese Aralia originated in the sub-tropic forests of Japan, Korea, & Taiwan. Fatsia plants are a type of evergreen plant that can be grown both indoors as a houseplant and outdoors in frost-free areas. A Fatsia Plant has shiny, leathery, medium green palmate (hand-shaped) leaves that grow at the ends of stiff stems. 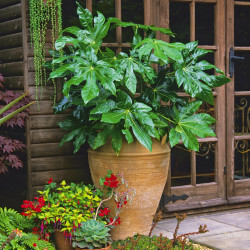 Fatsia Plants are compact upright plants that can grow up to 6 ft. tall, even indoors. Prune a Fatsia Plant aggressively to help keep the growth under control and the shape attractive. LIGHTING REQUIREMENTS: A Fatsia does well in bright filtered light. If you move it outdoors in the spring and summer, be sure to keep it in the shade. CARE INSTRUCTIONS WATER: Allow the top 50% of the soil to dry out before watering. The leaves may even start to droop a little. Brown brittle leaves indicate under-watering. Soft leaves that turn yellow and fall off indicate over-watering. FERTILIZER: Use a well-balanced liquid plant food every other week in the spring and summer at 1/2 the recommended strength. TEMPERATURE: A Fatsia likes cool temperatures especially in the winter when it is resting. It does well in temperatures between 45-55 degrees in the winter and never above 70 degrees during the rest of the year. HUMIDITY: This plant likes medium to high humidity FLOWERING: When used as an indoor plant, a Fatsia rarely gets the tiny white blooms found on it when it grows outdoors. Black berries usually follow flowers. PESTS: Fatsias attract spider mites, Mealy Bugs, scale, and Aphids. DISEASES: Since this plant likes medium to high humidity, powdery mildew may develop on the leaves. Provide good air circulation and try to keep the leaves dry. SOIL: Use a light, rich, fast draining potting soil. Ferns have been with us for more than 300 million years, and in that time, the diversification of their form has been phenomenal. Ferns grow in many different habitats around the world. The ferns were at their height during the Carboniferous Period (The Age Of Ferns) as they were the dominant part of the vegetation at that time. During this era some fern-like groups actually evolved seeds (the seed ferns), making up perhaps half of the fern like foliage in Carboniferous forests and much later giving rise to the flowering plants. Most of the ferns of the Carboniferous became extinct but some later evolved into our modern ferns. There are thousands of species in the world today. LIGHTING REQUIREMENTS: Ferns require lots of shade and ambient (rather than direct) sunlight. Place your plant near a north-facing window; east and west windows let in too much direct sunlight. You can put your fern next to a south-facing window if a north-facing window isn’t available. Keep the plant a bit away from the window, so that it receives more ambient light. CARE INSTRUCTIONS WATER: Ferns love a humid atmosphere, but they also prefer moist soil as well. Make sure that your fern’s potting mix is always damp (but never soaking). This may mean you water a small amount on a daily basis, rather than heavy amounts irregularly. FERTILIZER: Fertilize your ferns once a month. Visit your local gardening center and find a house plant fertilizer that specializes in species like ferns; ask an attendant for help, if necessary. Spray this fertilizer onto your ferns on a monthly basis to provide nutrients that the potting mix lacks. You should wait until at least six months after you’ve potted your fern to start fertilizing it, though. TEMPERATURE: Keep the temperature constant. Most indoor species of ferns are tropical, although not all require tropical weather. Make sure that the temperature in your home (or at least the room in which the fern is kept) is near 70 °F (21 °C). The ferns can handle temperatures as low as 60, but they won’t thrive as well under low temperature conditions. When in doubt, turn the temperature up. HUMIDITY: Keep the humidity high in proximity to your fern. High moisture levels in the air are perfect for humidity-loving ferns. There are two ways you can create higher humidity levels for your fern: double-pot your fern, or add a humidifier to your room. To double pot your fern, select a second pot slightly larger than the pot your ferns are planted in. Fill the pot with moss heavily soaked in water, and then place the second pot inside. Cover the top of the soil and the rim of the inner pot with the soaked moss, and wet it every few days to make sure it is still moist. PROONING: Remove dead or diseased parts of the fern. House-ferns are able to contract some diseases, however they tend to be hardy and don’t succumb to most. If your plant appears diseased, cut off the damaged areas. If your fern begins to die as a result of neglect, do the same by removing the damaged/dead area with a pair of shears. If your whole plant appears diseased, it is best to remove it before it spreads to other house plants. The Ficus Tree is a large houseplant that originally came from Asia, Malaysia, and India and contains quite a few verieties which share somewhat similar care and maintanace instructions. LIGHTING REQUIREMENTS: Ficus houseplants do well in bright indirect light, however it can survive in medium light. The lower the light level, the longer a Ficus Tree takes to produce new leaves. 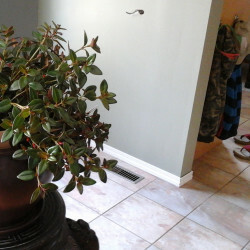 Rotate a Ficus houseplant weekly to maintain the plant's beautiful shape. CARE INSTRUCTIONS WATER: Allow the top 50% of the soil of a Ficus houseplant to dry out before watering. When you do water a Ficus Tree, water well enough so that it drains out the bottom drip holes. FERTILIZER: Feed a Ficus houseplant monthly with a well-balanced liquid fertilizer when the plant is actively growing. It is not necessary to feed a Ficus houseplant in the winter and fall. Avoid using any plant foods that contain the chemical Boron when feeding a Ficus Tree since these plants are sensitive to Boron. TEMPERATURE: Although a Ficus houseplant prefers temperatures between 60-85 degrees (19-25 C), these plants can survive in temperatures as low as 45 degrees for a short time HUMIDITY: A Ficus plant prefers medium humidity, but still does well in basic household humidity. FLOWERING: Ficus houseplants produce Insignificant flowers & berries that should be removed as soon as they appear. PESTS: Whitefly, Mealy Bugs, scale and thrips are plant pests that can attack a Ficus Alii Tree. DISEASE: Sbotrytis or Gray Mold are plant diseases that can occur when the leaves of a Ficus Alii plant are kept too wet. Anthracnose is another plant disease that can be a problem for Ficus trees. SOIL: Use a good, all purpose, well aerated potting soil for Ficus Alii houseplants. A Fittonia Plant (Nerve Plant/Mosaic Plant) is native to the tropical rainforests of Central and South America. It gets its nicknames, Nerve Plant or Mosaic Plant because of the distinct veined appearance of its beautiful ornamental leaves. These veins are always a different color than the rest of the leaf and can be white, pink or silver. The leaves of a Fittonia are about 2” long, green in color, and are attached to fuzzy stems. This is a small, compact, low-growing plant that looks good on windowsills, small shelves, and in terrariums. A Nerve Plant requires a little extra care, but it makes a great houseplant. Its lush variegated leaves brighten any room. LIGHTING REQUIREMENTS: Nerve plant grows best in low to medium light, though it also thrives in a sunny window if the light is filtered with a sheer curtain. If it gets too much hot sun, even indoors, the leaves may burn, turning brown and crispy. CARE INSTRUCTIONS WATER:Water nerve plant when the soil surface just barely starts to dry. This houseplant likes somewhat moist (but not wet, soggy) soil. FERTILIZER: Fertilize nerve plant a couple of times a year at minimum. For more growth, you can fertilize on a monthly basis, using a general-purpose houseplant fertilizer. Be sure to follow the directions on the fertilizer package. TEMPERATURE: Fishtail Palms prefer temperatures between 75-85 degrees during the day and 60-70 degrees at night. Try to keep a Fishtail Palm out of cold drafts and away from air conditioners. Nighttime temperatures should never go below 45 degrees. HUMIDITY: A Fittonia Plant loves high humidity. SOIL: Use a good, all purpose, well aerated potting soil for Fittonia houseplants. If you love indoor palm plants but are getting tired of the usual ones like the Bamboo Palm or Neantheabella Palm, it’s time to try a Fishtail Palm. A Fishtail Palm, native to Indonesia, Asia, and the South Pacific, is a large plant that can grow as tall as 6-10 ft. tall and 3-5 ft wide. A Fishtail Palm has fan-shaped fronds with bipinate smaller leaves. This means that there is a main leaf stem on a Fishtail Palm but the leaves come off of a secondary stem. The leaves of a Fishtail Palm have jagged edges and are shaped like the tail of a fish. A Fishtail Palm requires a little more care than some other palms, but you’ll love its exotic look. LIGHTING REQUIREMENTS: Fishtail Palms need very bright indirect light from an east or west-facing window. Avoid direct exposure to the sun. CARE INSTRUCTIONS WATER: Water a Fishtail Palm well and then allow the top 25% of the soil to dry out before watering again. Never allow the soil to totally dry out or permit a Fishtail Palm to sit in excess water. Leaf edges turn brown if there are too many chemicals in the water. If this is the case, use distilled water. FERTILIZER: Fertilize a Fishtail Palm monthly, when it is actively growing, with a basic houseplant food at 1/2 the recommended strength. Never fertilize in the winter. TEMPERATURE: Fishtail Palms prefer temperatures between 75-85 degrees during the day and 60-70 degrees at night. Try to keep a Fishtail Palm out of cold drafts and away from air conditioners. Nighttime temperatures should never go below 45 degrees. HUMIDITY: A Fishtail Palm thrives in high humidity. It does exceptionally well in spas and indoor pool areas. PESTS: spider mites are the main problem. Spray a Fishtail Palm with a mild solution of warm soapy water a few times a month. This prevents and gets rid of spider mites. It also keep the fronds clean and free of dust. SOIL: Fishtail Palms grow best when planted in a fast-draining porous soil containing a large amount of organic matter. If you have a high light area that calls for a hanging or table plant that flowers, Goldfish House Plants are a perfect choice. A Goldfish Plant, native to Southern Mexico, Brazil, and Costa Rica comes in over 25 different varieties. Goldfish HousePlants have hundreds of small, thick, shiny, dark green leaves and colorful flowers that resemble tiny goldfish. The flowers on a Goldfish Plant may be red, orange, or yellow. Goldfish HousePlants are easy to care for, drought resistant, and, with proper care, can bloom all year. LIGHTING REQUIREMENTS: A Goldfish Plant requires bright indirect light especially if you want it to develop flowers. CARE INSTRUCTIONS WATER: Allow the top 25%-30% of the soil in a Goldfish Plant to dry out before watering. Green leaves fall off a Goldfish Plant when the plant is too wet or too dry. FERTILIZER: Fertilize a Goldfish Plant every two weeks in the spring and summer when it is actively growing with a basic plant food at 1/2 the recommended strength. Feed a Goldfish Plant monthly in the fall and winter. TEMPERATURE: Goldfish Plants do well in temperatures between 65-85 degrees. Intense heat burns the leaves of a Goldfish Plant. Try to keep a Goldfish Plants out of drafts and away from heaters. HUMIDITY: Goldfish Plants prefer high humidity, but adapt well to basic household humidity. FLOWERING: Keep a Goldfish Plant in a small pot and in a very bright location to encourage it to flower. PESTS: Goldfish Plants attract the plant pests Aphids and Mealy Bugs. It’s difficult to eliminate these plant pests once they have infected a Goldfish Plant because of the numerous small leaves where they love to hide. Spray a Goldfish Plant thoroughly with the green solution to get rid of plant pests but try to avoid the flowers. SOIL: Goldfish Plants like a rich potting soil that holds water but still drains quickly. An African Violet soil works well for a Goldfish Plant also. There are over 200 species of the easy to grow almost indestructible Hoya Plant. Hoya Plants are often referred to as Wax Plants because of the waxy nature of their leaves and flowers. Hoya Plants have long trailing vines that often intertwine. Under the proper conditions all Hoya Plants produce five-pointed, star shaped, fragrant flowers that come in red, white, pink, purple, yellow, orange, and even black. Hoya Plants are perfect to hang in front of a bright sunny window. Even a plant novice will be successful growing a Hoya Plant if they avoid over-watering. LIGHTING REQUIREMENTS: Hoya Plants do best and bloom more often in very bright light. They are one of the few indoor houseplants that can even thrive in direct sun. Although Hoya Plants can adapt to lower light, they grow slower and do not produce the fragrant waxy flowers that are so beautiful. CARE INSTRUCTIONS WATER: Hoya Plants are Succulent Plants. The soil of a Hoya Plant should dry out before being watered. These plants do thrive on neglect, but need additional water when in bloom. FERTILIZER: Feed a Hoya Plant monthly with a balanced houseplant food at 1/2 the recommended strength when it is actively growing. TEMPERATURE: Hoya Plants can adapt to almost any moderate temperature, but prefer 60-65 degrees at night and 70-80 degrees during the day. HUMIDITY: Provide basic household humidity or lower for Hoya Houseplants. FLOWERING: A Hoya Plant produces beautiful clusters of fragrant flowers in numerous colors. Each Hoya flower has five waxy petals. New flowers develop on the older stems of a Hoya Plant so never cut off the old flower stems. PESTS: Hoya Plants are bothered by Mealy Bugs, spider mites, and Aphids. Spray the entire Hoya plant, reaching every little twisted section if possible, with the green solution to treat plant pests. DISEASES: The main plant diseases that affect Hoya Plants are botrytis, a fungus that causes grayish areas on the leaves, and crown, stem, and root rot, a fungal disease caused by humid warm conditions, wet leaves, soggy soil, and poor air circulation. SOIL: Use a well-aerated fast-draining potting soil for a Hoya Plant. Add a little sand to the soil if it seems too heavy and is not drying out quickly. An Emerald Gem Plant or Homalomena, native to tropical Asia and South America, is an upright plant with dark green, waxy, spade-shaped leaves. The short compact shape of an Emerald Gem Plant makes it ideal for areas with height restrictions. Emerald Gem Plants are usually 12″-30″ in height when sold in the stores. Although an Emerald Gem Plant is a relative of the easy-care Philodendron, it is a lot more finicky and requires more attention. However, if you are tired of the same old houseplants, a Homalomena or Emerald gem Plant makes a nice addition to your plant collection. LIGHTING REQUIREMENTS: A Homalomena Plant requires medium indirect light but grows even better in bright indirect light. Homalomenas can survive in low light but become thin and spindly. The bottom leaves of an Emerald Gem Plant turn yellow and fall off when there is not enough light. CARE INSTRUCTIONS WATER: Watering is the most difficult part of caring for an Emerald Gem Plant. When an Emerald Gem Plant is either over or under watered the bottom leaves fall off. Always allow the top 50% of the soil of an Emerald Gem Plant to dry out before watering. An Emerald Gem Plant doesn’t like anything cold, so use warm water and never dump extra ice cubes into the soil. FERTILIZER: Feed an Emerald Gem Plant monthly in the spring and summer when the plant is actively growing with a basic houseplant food at 1/2 the recommended strength. In the fall and winter fertilize an Emerald Gem Plant every other month if the plant is producing new leaves. TEMPERATURE: Emerald Gem Plants like warm household temperatures between 65-80 degrees. Keep Homalomanas away from air conditioners and cold drafts. HUMIDITY: An Emerald Gem Plant does well in regular household humidity. FLOWERING: An Emerald Gem Plant or Homalomena produces spaths which rarely open so flowers are not often seen. PESTS: Emerald Gem Plants are fairly pest resistant. If spider mites, Mealy Bugs, or white flies appear, spray an Emerald Gem Plant with the green solution. DISEASES: Emerald Gem plants are disease resistant plants. SOIL: Use a quick-draining, loose soil, containing plenty of peat moss, perlite, and hard sand for an Emerald gem Plant. This type of soil helps prevent an Emerald gem Plant from getting root rot. Ivy Plants (and their relatives) have dark green glossy leaves that grow off of long thin stems. Ivy Plants are only about 18″ tall but can have trailing vines up to 10ft. in length. Trailing vine plants like a Grape Ivy look beautiful sitting on a table, hanging in a basket, or standing on the floor as a tall pole plant. The tendrils of a Grape or Oak Leaf Ivy Plant help them cling to poles or pieces of bark. Grape and Oak Leaf Ivy Plants may be a little difficult to locate because many greenhouses don’t want to spend the extra money and time it takes to grow them properly. The new varieties of Ivy Plants are hardier and less prone to disease than the older varieties and make excellent house plants. LIGHTING REQUIREMENTS: Ivy Plants require medium to high light. If the stems of a Ivy Plant stretch toward the light and new leaves are further apart on the stem, move your Ivy Plant to a brighter location. CARE INSTRUCTIONS WATER: Water well and then allow the top 50% of the soil of a Ivy Plant to dry out before watering again. FERTILIZER: Ivy Plants every other month when it is actively growing with a basic houseplant food at 1/2 the recommended strength. An Ivy Plant should not be fed in the winter. Yellow leaves on an Ivy Plant usually means the plant needs more food. TEMPERATURE: Ivy Plants can handle temperatures from 40-90 degrees, although growth slows above 80 degrees. The ideal temperature for an Ivy Plant is 60-80 degrees. HUMIDITY: Basic household humidity is fine for a Grape Ivy Plant. PESTS: Ivy Plants attract Mealy Bugs and spider mites. DISEASES: Ivy Plants are prone to powdery mildew. Provide good air circulation around a Grape Ivy Plant and keep the leaves dry to prevent powdery mildew. SOIL: Use a well-aerated soil that drains quickly for a Grape Ivy Plant. Grape Ivy Plants grow well in African Violet soil. The Prayer Plant, native to Brazil. Asia, and Africa, is a very unique plant. The large patterned leaves of a Prayer Plant, with hues of red, green, brown, and cream, lift up and fold together each evening as though praying and open again the next morning. Although the flowers of a Prayer Plant are small and insignificant, the patches of color on the leaves of a Prayer Plant get darker and more vibrant as the plant gets older. 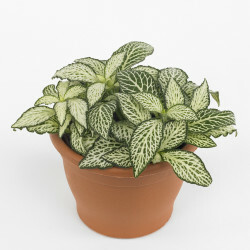 Some interesting varieties of the Prayer Plant include the Rabbits Tracks Plant and Herringbone Plant varieties. A Prayer Plant requires a warm humid environment in order to grow well. LIGHTING REQUIREMENTS: Prayer Plants do well in medium to high light, but no direct sun. When there is not enough light, the leaves of a Prayer Plant close at night and do not fully open during the day. When a Prayer Plant gets too much light, the color in the leaves starts to fade. CARE INSTRUCTIONS WATER: Keep the soil of a Prayer Plant moist but never soggy. Unlike most houseplants, a Prayer Plant does not like to dry out before you water. 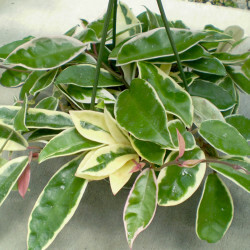 FERTILIZER: A Prayer Plant is an acid loving houseplant. Feed a Prayer Plant with a basic houseplant food like Miracid, at ½ the recommended strength, every two weeks in the spring and summer. It’s not necessary to fertilize a Prayer Plant in the winter and fall. A Prayer Plant will love your extra tea. TEMPERATURE: A Prayer Plant prefers normal household temperatures between 60-80 degrees. Lower temperatures can damage the leaves of a Prayer Plant. HUMIDITY: Since a Prayer Plant likes a very humid environment, the humidity in ours homes is often too low. Increase the humidity around a Prayer Plant by grouping plants together, putting a small humidifier or bowl of water near the plant, or setting a Prayer Plant on a tray filled with water and small stones. Be sure the Prayer Plant is sitting on the pebbles and not in the water. FLOWERING: The flowers of a Prayer Plant are small and insignificant. PESTS: Mealy Bugs, spider mites, and Aphids are plant pests that can attack a Prayer Plant. DISEASES: The high humidity a Prayer Plant needs encourages Leaf Spot Disease. SOIL: Prayer Plants grow well in a well-aerated peat based indoor potting soil that retains water yet still drains quickly. Pothos Plants, native to the jungles of Malaysia, are highly adaptable, glossy-leafed plants with heart-shaped leaves. A Golden Pothos has yellow and green leaves, a Marble Queen Pothos has white and green leaves, and a Jade Pothos has solid green leaves. These attractive plants can sit on a table or on the floor, hang in a basket, or grow 5ft tall when attached to a pole. Pothos Plants are easy to care for and can grow almost anywhere. In other words, a Pothos Plant is the perfect houseplant for beginners. LIGHTING REQUIREMENTS: There is a Pothos Plant variety for almost any light situation. Green Jade Pothos houseplants with their solid green leaves do well in low light. The Golden Pothos variety with yellow and green leaves likes medium to low light. Marble Queen Pothos with green and white leaves grow best in medium to high light. The lighter the color in the leaves, the more light a Pothos Plant requires. CARE INSTRUCTIONS WATER: Water a Pothos Plant well and then allow the top 50% of the soil to dry out before watering again. Over-watering is almost the only way to kill a Pothos Plant. Bright yellow leaves indicate that a Pothos Plant has gotten too dry before you watered it. New growth and older leaves turn black when a Pothos Plant is over-watered. FERTILIZER: Fertilize Pothos Plants every two weeks in the spring and summer when the plant is actively growing and monthly in the fall and winter. Use a basic well-balanced plant food diluted to ½ the recommended strength. TEMPERATURE: Pothos Plants do well in temperatures between 55 and 80 degrees. If temperatures drop below 45 degrees, a Pothos Plant stops growing and the leaves turn black. HUMIDITY: Basic household humidity is sufficient for a Pothos Plant. PESTS: Pothos Plants are relatively pest resistant. If the soil stays too damp, Fungus Gnats may appear. Mealy Bugs are also sometimes a problem. DISEASES: Over-watering a Pothos Plant causes plant diseases such as Crown, Leaf, and Root Rot. Once the roots are destroyed, the plant dies. SOIL: Use a well-aerated quick-draining potting soil that dries out quickly for a Pothos Plant. There are over 200 different varieties of Philodendron Plants, all with different size, color, and shape of leaves. Philodendron are some of the most popular indoor plants we use in homes and offices because they thrive on neglect and are almost impossible to kill. 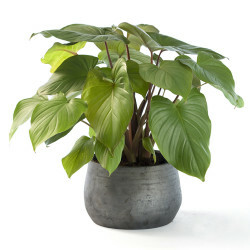 Another great plus, Philodendron Plants remove air-born toxins such as formaldehyde from the air. All Philodendron houseplants are poisonous plants so please keep them away from small children and pets. LIGHTING REQUIREMENTS: A Philodendron houseplant can survive in low light conditions, but grows faster and produces more leaves in medium light and high light. Some Philodendron plants can acclimate to outdoors. CARE INSTRUCTIONS WATER: Water a Philodendron houseplant well and then allow the top 50% of the soil to dry out before watering again. Yellow leaves on a Philodendron indicate over- watering and brown leaves on a Philodendron mean the plant needs more water. FERTILIZER: Feed a Philodendron monthly in the spring and summer with a basic houseplant food at 1/2 the recommended strength. Fertilize a Philodendron every other month in the fall and winter. Philodendron Plants are fast growing houseplants and need quite a bit of plant food, but should be fertilized only when they are producing new leaves. TEMPERATURE: Philodendrons grow well in temperatures between 70-80ºF (24-27ºC) during the day and above 55ºF (13ºC) at night. HUMIDITY: Basic household humidity is fine for a Philodendron. Increased humidity may encourage larger leaves. FLOWERING: A Philodendron does not produce flowers. PESTS: Keep an eye out for Aphids, spider mites, Mealy Bugs, thrips, and scale on Philodendron houseplants. These plant pest problems can occasionally occur. DISEASES: Root Rot from over-watering is the main plant disease problem. SOIL: Plant a Philodendron in a well-aerated houseplant soil that drains quickly.